일정규모 이상의 사업장인 경우 오염원을 매체별로 관리하는 것보다는 이를 통합하여 관리하는 것이 보다 효율적이라는 개념에서 통합오염관리가 시작되었다. 통합오염관리가 되면 그간 매체별 관리에 비해 인허가 절차가 간소화되고 인허가 과정에서의 협의 및 참여절차가 확대된다. 통합오염관리의 가장 핵심적인 것이 최적가용기법(BAT)이다. 최적가용기법을 통해 규제대상의 규모와 특성에 맞는 유연성 있는 규제가 가능하게 되었다. 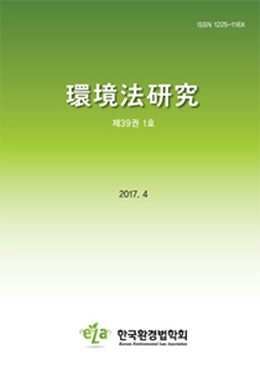 통합오염관리개념은 1991년 OECD의 권고에서도 찾아볼 수 있다. 유럽연합은 1996년 높은 수준의 환경보호를 목적으로 하는 `통합오염예방 및 관리(IPPC)에 관한 지침`을 제정하였다. 주요내용은 환경매체의 통합적 검토, 환경상 중대한 위해를 가하지 않을 의무와 사전배려, 최적가용기법의 적용, 허가 등의 정보에 자유롭게 접근 그리고 이를 통한 주민참여이다. 영국은 통합오염관리개념을 최초로 검토한 나라이며, 1990년에 환경보호법(EPA)을 통해 이를 법제화하였다. 독일은 연방임밋시온법(BlmSchG)를 통해서 이 제도를 도입하여 운영하고 있다. 우리의 통합오염관리에 대해서는 통합오염시설 허가의 법적 성질이 문제된다. 순수한 허가인지 아니면 특허로 볼 것인지이다. 시설에 대한 허가의 내용이 기속적이 아니라 재량판단을 포함하고 있기 때문에 이를 특허로 볼 수도 있을 것이다. 정보공개제도는 유럽 통합오염관리제도의 핵심적 요소 중의 하나인데 반해, 우리의 경우는 제한적이다. 정보공개가 이루어져야 주민의 참여가 활발히 이루어질 수 있다는 점에서 정보공개의 범위확대가 이루어져야 한다. 다만 기업의 경영상의 정보와의 조화도 필요하다. 허가권이 중앙정부에 집중됨으로써 오염시설이 위치한 지방자치단체의 참여가 제한적이다. 지자체의 의견청취 및 권한의 위임 그리고 협력을 통한 횡적 협조가 필요하며, 더 나아가서는 일정한 권한의 분점이 필요하다. 통합오염관리제도의 핵심인 최적가용기법의 적용에 있어서는 재량판단이 작용할 수 있어 판단에 따라 환경보다는 산업적 고려가 우선적으로 작용할 수 있다. 따라서 객관성의 확보가 중요하다. 제도의 운영을 통해 나타나는 문제점들에 대해 지속적인 관심과 개선노력이 필요하다. Integrated pollution prevention and control (IPPC) came into use due to the realization that it is more efficient for businesses of a certain size or above to conduct an integrated prevention and control system rather than managing pollutant by factor. When conducting the integrated pollution prevention and control, the licensing procedure become simpler than the pollution prevention and control by factor is implemented. As well as this, the procedure of negotiation and participation is expanded in the course of licensing. The crux of the integrated pollution prevention and control is Best Available Techniques Economically Achievable (BAT), through which it became possible to conduct more flexible control system, suitable for the scale and characteristics of the objects. OECD Council Recommendation in 1991 also specifies the concept of the integrated pollution prevention and control. The European Union (EU) formulated the guidelines of the integrated pollution prevention and control aiming at the high level of environmental protection in 1996. The main contents include integrated investigation in environmental factors, prior consideration & obligation not to harm the environment severely, the free access to the information on the application & approval of best available techniques economically achievable, and community involvement through the system (IPPC). The United Kingdom is the first nation that reviewed “IPPC”, and legalized this through the environmental protection law in 1990. And Germany has been operating IPPC system by applying it through BlmSchG. When it comes to the application of IPPC system in Korea, its legal characteristics are vague to obtain the approval of establishing facilities for the integrated pollution prevention and control. This is, whether it needs a simple approval or a special approval by public law. This may be regarded as a charter or a special approval because the contents of the approval on the facilities are not bound strictly by law but recognizes the discretionary decision. While the information disclosure system is one of primary elements for EU`s integrated pollution prevention and control system, this is limited in the case of Korea`s. To promote the active community involvement, it is essential to expand the range of the information disclosure. Yet, The harmonization with management information of enterprises is also necessary. As the authority focuses on the central government, the participation of the local governments, where pollution control facilities are located in, is limited. This calls for the horizontal collaboration through delegation of power and hearing of local governments` opinions. The discretionary decision can be also accepted by applying BAT, the crux of the integrated pollution prevention and control system, this may prioritize consideration of the industries rather than the environment. Thus, it is important to acquire objectivity, and to pay continuous attention as well as efforts to improve the problems with operating the system.